At 5 ½”, much larger than the another non-catalog Darter. of this bait are reported to exist. This one is Blue Flash. from the body of a #6900 Striper Pikie. Shown with a #2001 Darter for size comparison. Apparently given to sporting goods stores as a display piece. decal still affixed to the lip. Carried to major sporting goods conventions in order to show the latest line of available baits. 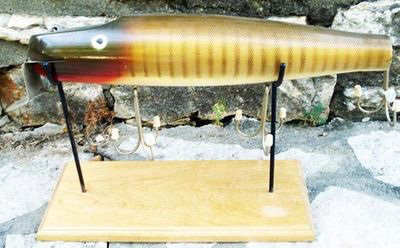 The Shur-Strike version held three early 1930s baits. The box was never illustrated so we aren't certain which baits were included. One of the variations of labels on a Creek Chub line spool. This one is in mint condition with the original line. It was once owned by the V.P. 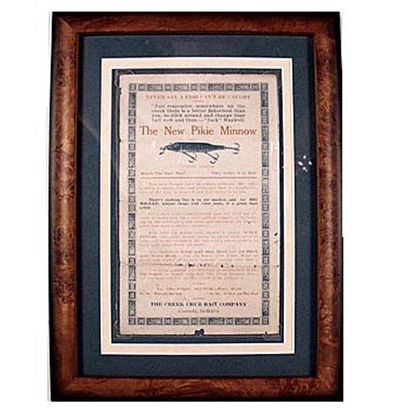 of the Cortland Fishing Line Co. This was the company that produced this variation of spools and line for Creek Chub. 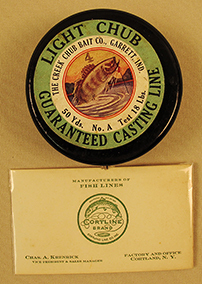 There were several other variations of labels and line test that were offered long ago by Creek Chub. All are rare and missing in most Creek Chub collections. Surely not produced by CCBCo, but offered in some of their earlier catalogs. 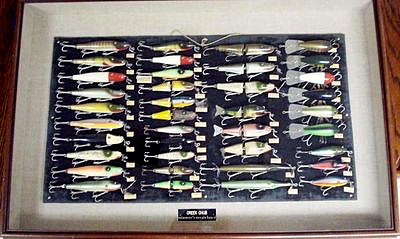 Although Creek Chub sold many styles of rods over the years, only a few marked rods are known. One of the rarest collectible from this company. Most advanced collectors haven’t seen an example. 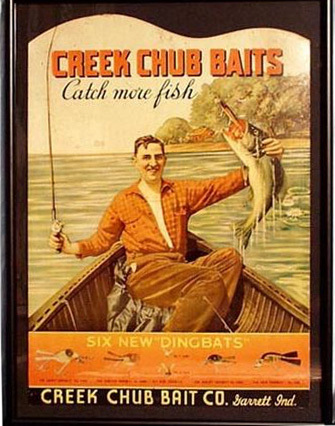 This rare sign is very similar to the cover of the 1923 Creek Chub catalog. 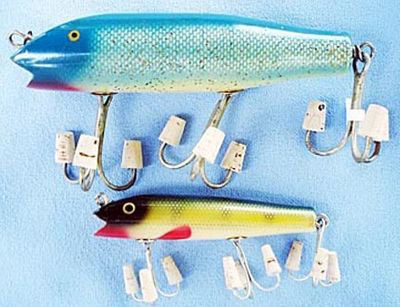 The artist who designed the cover simply deleted part of the text at the bottom of his catalog rendering and replaced it with a likeness of a Polly Wiggle and a Flat Side Chub (Injured Minnow) plus the names of these two lures. “New Ones” was entered below the bait illustrations. The back of the sign has a cardboard easel and a label added by the maker of the sign. The printer was in Ft. Wayne, not far from Garrett, Indiana. The printing process was patented in 1918. If this sign is viewed at an angle you will notice the colors are layered over each other. Apparently, the colors were applied one at a time similar to stone lithography. 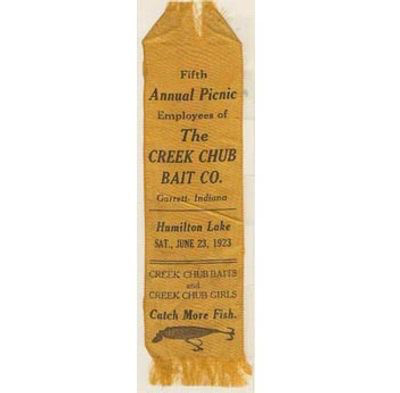 Evidently, this was an expensive process because Creek Chub eventually had their signs printed by a more economical photomechanical process. One of the few known ribbons from their annual employee picnic. This one is from the fifth event in 1923. Personal collectibles such as this prove rarity doesn’t always equate into great value. CCBCo commissioned this promotional die cut cardboard sign in order to introduce its "Six New Dingbats". Above the banner is a smiling angler in his canoe, pulling aboard a nice bass caught on a CCBCo Pikie. These counter top signs were sent to sporting goods retailers throughout the U.S. Unfortunately, most of these advertisements were eventually discarded, resulting in few examples surviving today. This small advertising flyer was produced c.1920 to be included in the then new Pikie Intro "Picture Box". Those I have seen all have folds from storage in these boxes. This style reel is known as a Wawasee (named after an Indiana lake) or an Indiana-style reel. It was produced by O.K. 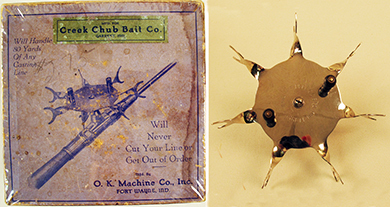 Machine Co. in Ft. Wayne, IN & was stamped with the Creek Chub company name. Evidently, sales were limited for the CCBCO reel because it is a scarce commodity today. 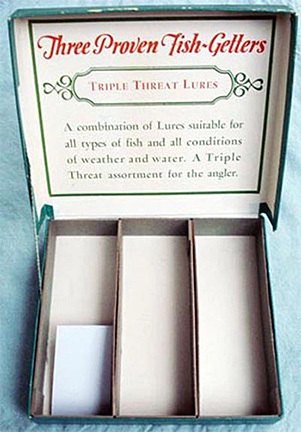 This boxed set was purchased out of a major lure auction. The actual box has the CCBCo info on a label affixed to the top of the box. Unbelievably, the original packing slip for this set is intact. It's directly from CCBCO instead of a dealer. It's dated 1938 & the price was $2.75.